The buttons are, again, from TessaAnn on Etsy. Aren’t they perfect?? I love(1000) this sweater. It might be my most favorite project ever. And the munchkin informed that she “yuvs” it, too, which is high praise indeed. It’s a little bit big on her right now, but hopefully that means she’ll get a bit of wear out of it. 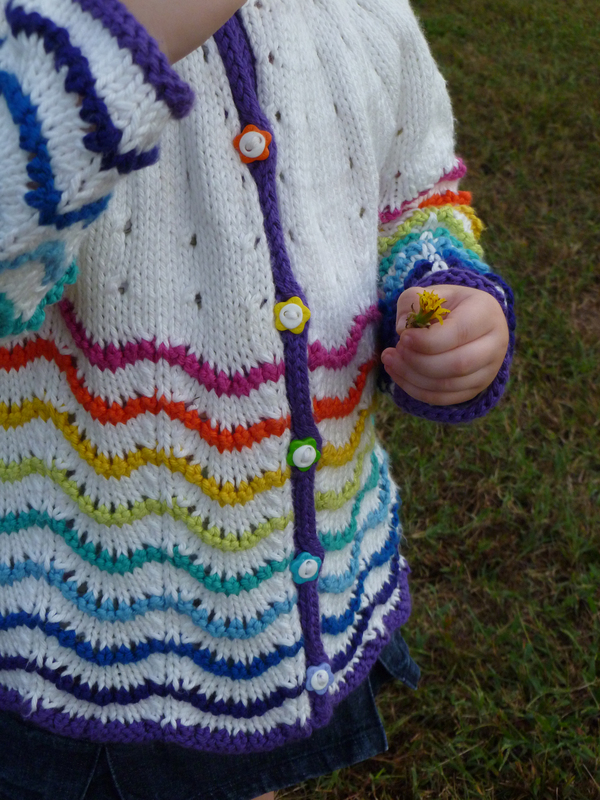 The round yoke is quite roomy and the sleeves could be worn as 3/4 length on a larger child. Just under three months, which is pretty good considering that I forgot the yarn on vacation and then lost the last skein of white yarn and had to order more. 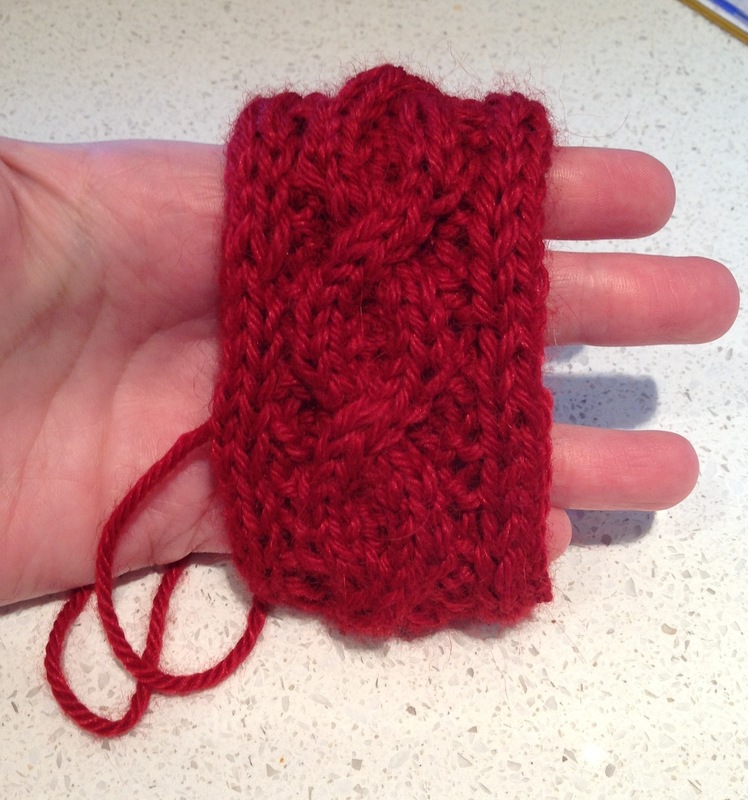 I’ve been told that the “I” in i-cord stands for “idiot,” which I find to be quite unfortunate, because it is one of my favorite knitting techniques. By itself, it makes lovely ties and is a fun way to finish off the top of a hat. Applied i-cord gives you even more options and is one of my favorite ways of finishing off a raw edge. 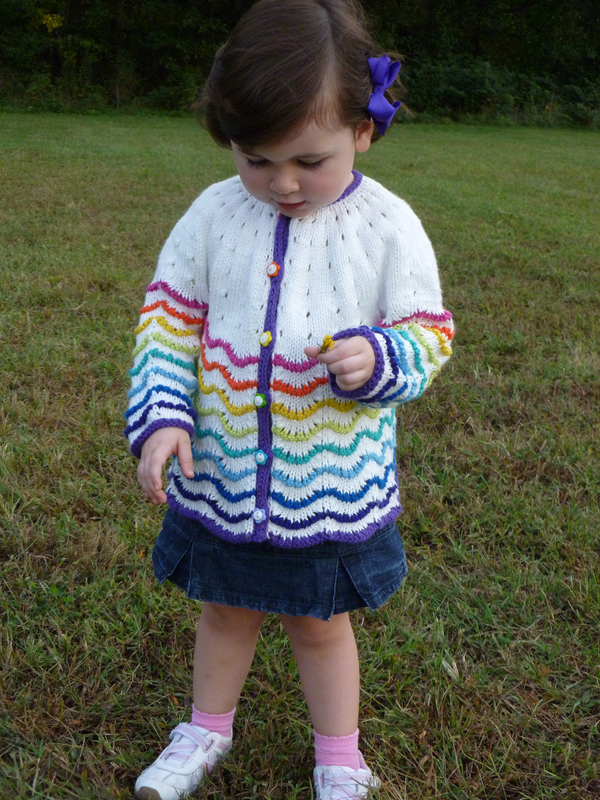 For the Scalloped Lace Toddler Cardigan, I decided to work the button bands with applied i-cord in a contrasting color. I picked up and knit on the right side with the purple yarn, purled back, and on the next row worked 3-stitch i-cord. When I came to a buttonhole, I worked the bottom half of the buttonhole like TECHknitter’s Tulips buttonhole, and for the top I simply worked three rounds of plain (unattached) i-cord. It worked like a charm. I liked the way the contrasting trim looked so much, I decided to do the same thing around the neckline. Except that I didn’t want to work any extra rows. I picked up stitches around the cast-on edge of the neck with a sock-sized circular needle. I tried to work i-cord directly on those stitches, but the white yarn underneath showed through. I knew there had to be another trick, so I hunted around online (Thank you, Google!) and found this technique at The Purl Bee. Brilliant! 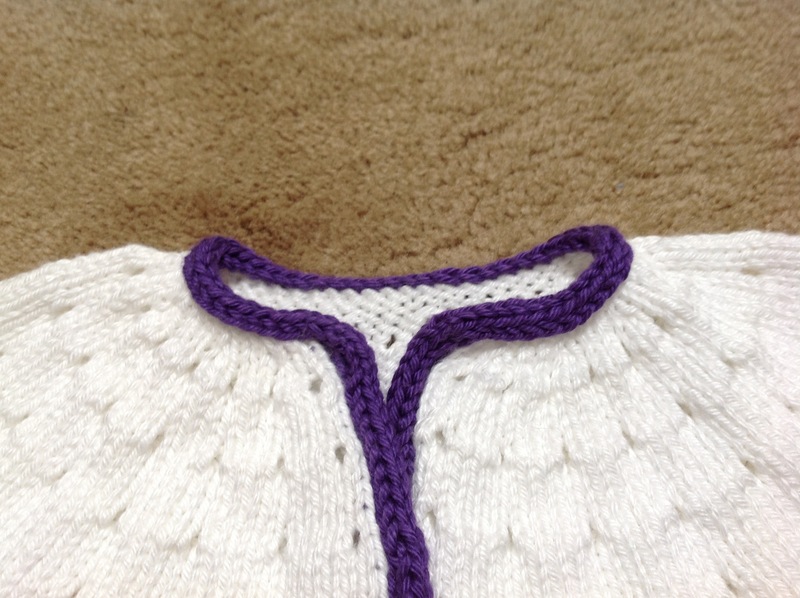 I even figured out how to weave in the ends so that the I cord appears to travel seamlessly around the neckline. 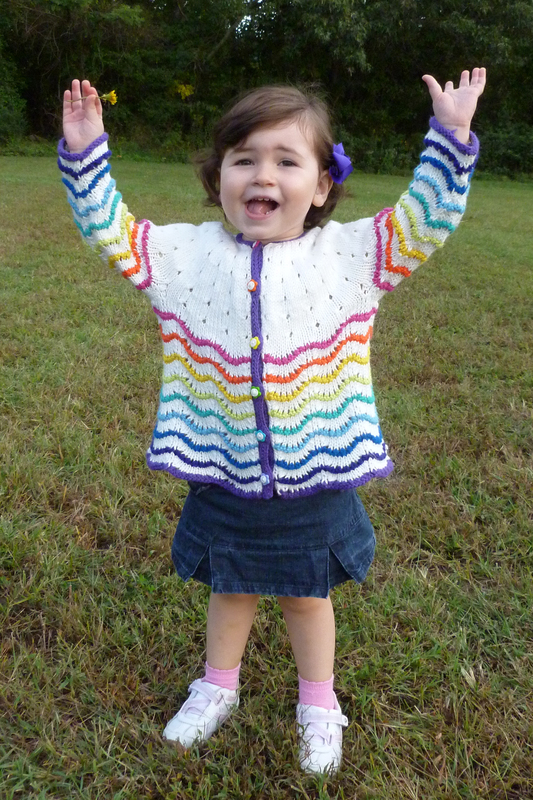 So all this time spent waiting for my yarn order so I can finish the sweater wasn’t totally wasted. The next sweater I knit is going to be a solid color, with a yarn I can split-splice, so I only have two ends to weave in when I’m done!! I had big knitting plans for the weekend. 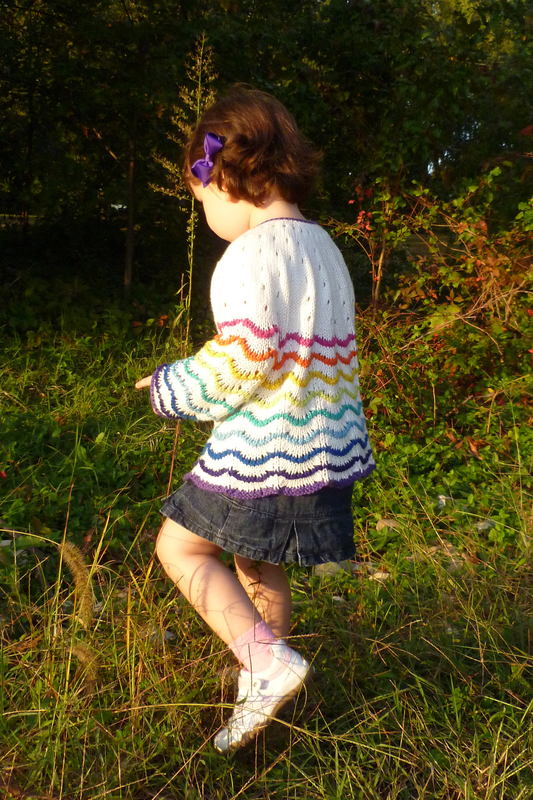 The Scalloped Lace Toddler Cardigan has been languishing in my knitting basket since we got home from vacation and it was reunited with the missing skein of pink yarn. 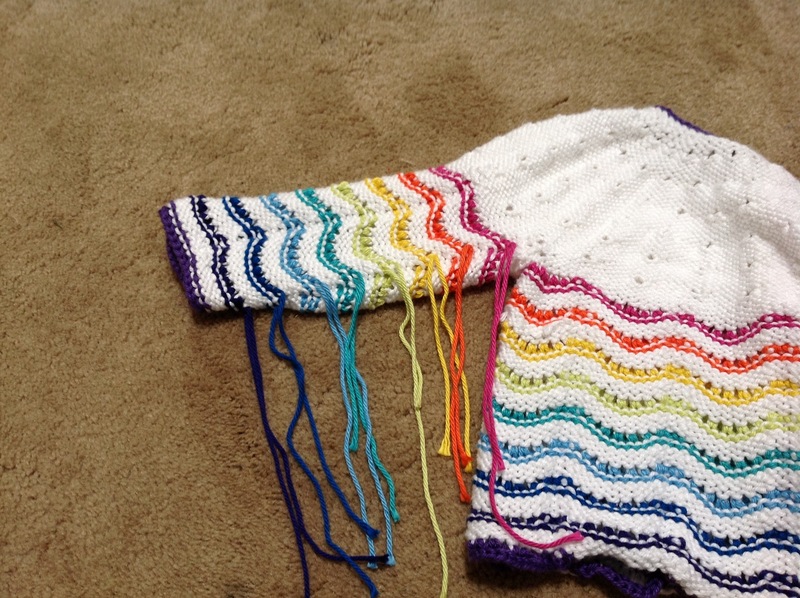 It needed two sleeves (and eleventy-billion ends woven in), so really, it was practically done, right? Yes. I was out of yarn. With only a little over two inches of a small sleeve to go. Gah! So I sulked. And knit on a sock for a while. But finally I accepted there was no way around it; I was just going to have to order more yarn. This particular yarn (Shine Worsted) came from KnitPicks. It’s about $3 a skein. So I went to the KP website… and promptly spent $50. On the plus side, I got several books from their 40% off sale, and free shipping. 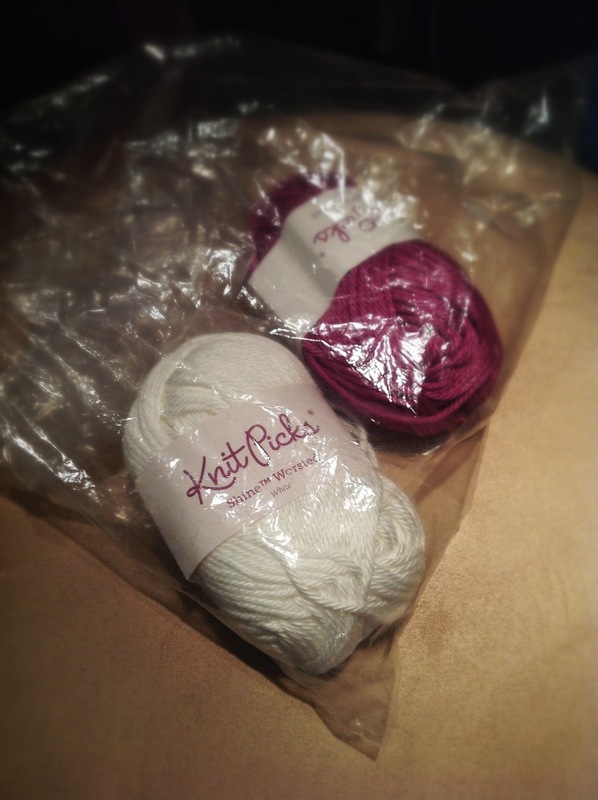 On the minus side… I spent $50 to get a $3 skein of yarn. My husband would not find that to be such a great deal. So I also bought three skeins of Felici Sport to make a pair of socks for his gargantuan feet. I’m sure he’ll understand. But the darn sweater is still sitting there, mocking me. It was chilly yesterday morning, and the munchkin informed me that she was cold. A sweater would have been perfect. Sigh. 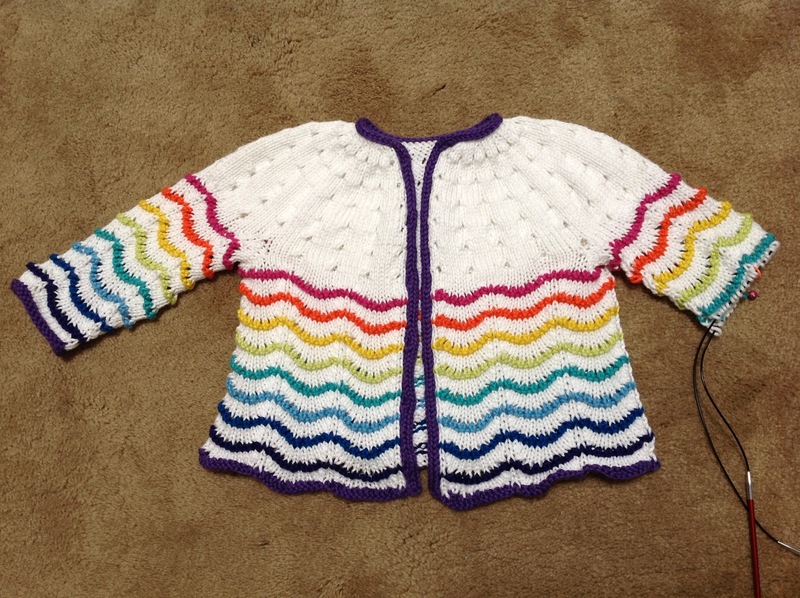 Knitting, sometimes thou art a cruel mistress…. Both socks are about the same size, but the second sock used 4g less yarn than the first. I’m not sure how much of that was the heel structure and how much of that was gauge. 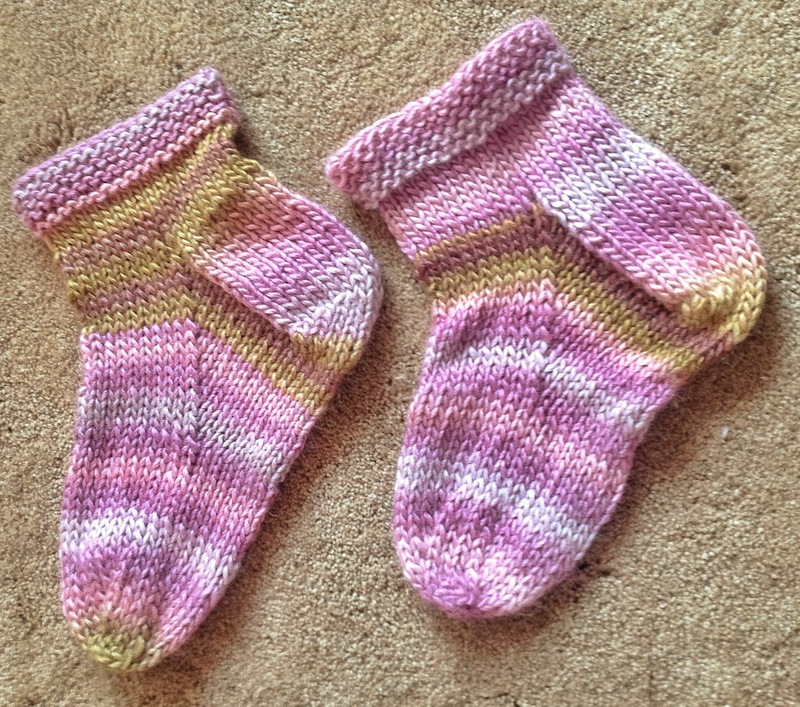 I worked the the first sock using DPNs from and the second using circulars from a different manufacturer. I worked the back of both socks above the heel turn using needles one size smaller, but I switched back to the larger needles sooner on the first sock. The only piece of the puzzle that I’m not totally happy with is the bind-off at the top of the sock. I worked the k1, *p1, slip both stitches back to the left needle and p2tog, k1, slip both stitches back to the left needle and k2tog, repeat from * bind off. (I’m not sure what it’s called exactly.) It’s super-stretchy, which is great, but it flares out a lot, which is not so great. I didn’t weave in the ends yet; I think I might pull it out and work a tubular bind-off instead. In the meantime…. Right after I snapped this picture, I ripped the first sock back to the heel. I’ll ponder the bind-off while I redo the heel and leg. I’m open to suggestions! So… about those slippers I made for my daughter… The first set I made was a bit too small, but (since I had a large amount of Patons SWS in my stash) I decided to knit up another pair. 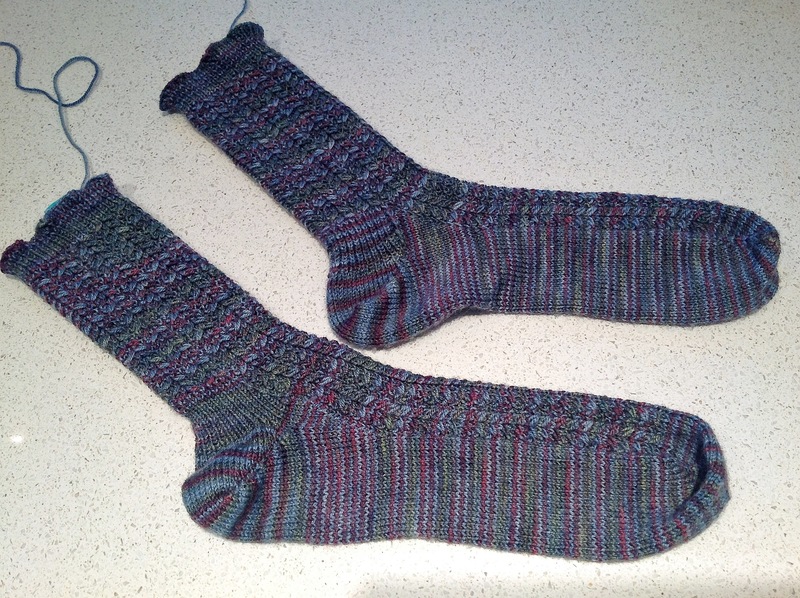 I finished this pair while we were on vacation, despite having to improvise a bit on needle size. They languished in my knitting bag while I was catching up on our post-vacation laundry, but yesterday I pulled them out and decided to do something about them. I felted the first pair in the sink. It took a loooooong while, but I finally got them to felt up. In fact, they felted up a bit too small! For the second try, I decided to do something different and try felting in my washing machine. Rumor has it that you can open up a front-load washer during the cycle and the water level will be so low that it won’t spill out. I tried this out once and got suds all over my laundry room floor, so I wasn’t about to try it again. I threw in some towels and turned the washer on. When the cycle was finally done, I fished out the bag with the slippers in it. They had felted. In fact, one of them had felted closed in the middle of the foot! And everywhere they had creased in the washer, they had felted into a lump. So I had two small, lumpy, misshapen slippers, only one of which would actually hold a toddler’s foot. Yes, I’m going to knit her another pair. In a bit. I’m still feeling a bit grumpy now though! Today is the first day of school here. My son is grumbling and packing up his new school supplies, but like many moms, I’m looking forward to the start of the new school year. Especially since my youngest will be attending preschool for two mornings a week, which means that I will have two whole hours to myself, two mornings a week. Yes, my first stop will be at my LYS. How did you guess?! The last couple of weeks have been crazy. In addition to all the back-to-school errands, we snuck away for a family vacation (from which I brought home a lovely stomach flu souvenir, sigh). We made our annual pilgrimage to my parents’ vacation home on a lake in the Pocono Mountains of Pennsylvania. It’s a lovely, peaceful place. We sleep in (well, as much as the kids will let us! ), take long walks, and go swimming and canoeing. My husband and son did a lot of fishing in the lake and caught enough keeper-sized fish for dinner one evening. I, of course, brought plenty of knitting to keep me busy while our youngest was napping. I had the second Solemate sock to finish, as I had gotten distracted from my Ravellenic project by the felted slippers for my daughter. The first pair of slippers were a bit tight on her, so I cast on for a second pair, which I brought with me. 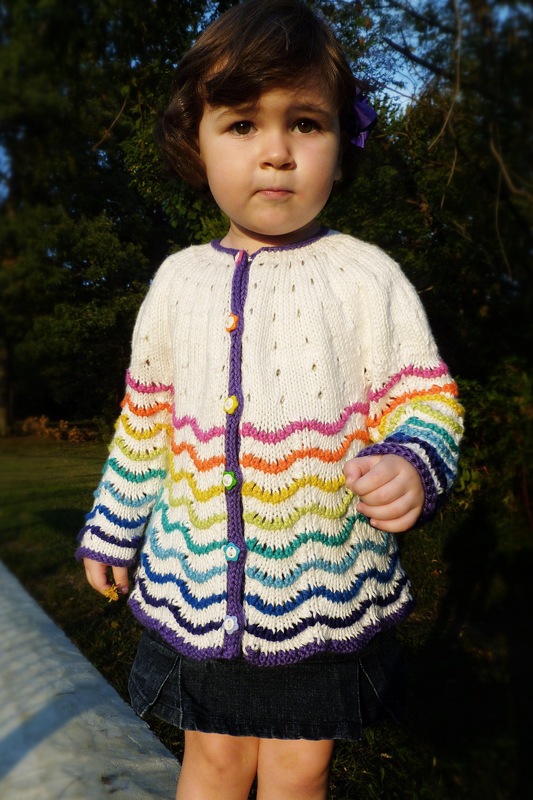 The project I most hoped to complete during the week was the Scalloped Lace Toddler sweater, but at the last minute, I also threw in the Cathay yarn I’d purchased for a Tahoe sweater. I didn’t want to be caught “under-yarned” as the Yarn Harlot says! The key words in that last paragraph are “at the last minute.” I’m the chief packer for my family. My husband packs his own clothes and the fishing gear, but I’m in charge of pretty much everything else. This means that I pack clothes for myself and the kids. I pack toys and activities to amuse them. I pack the not-insignificant amount of gear that you need with a toddler. I plan the meals we’ll eat and decide what we should take with us and what we can buy up there. There’s no washing machine, so we pack our own sheets and towels, plus beach towels, etc. You get the point; it’s a lot of stuff. And I’m always worried about forgetting something vital, so I made lists and triple-checked them. So the end result is that, although I thought about what knitting projects I’d want to take with me, I didn’t actually pack any of them until the morning we left. I realized my first mistake before we’d been on the road an hour. I pulled out the slipper I was working on and discovered that, since I’d been working in the round, I had two different size tips on my circular needle. Which wouldn’t have been a big deal except that I was ready to begin working the heel flap, which is worked flat. D’oh. I contemplated changing the tips around at the end of every row and decided I’d rather just poke myself in the eye with one of them. I dig around in my bag and came up with an empty size 6 circular needle. I was using a size 11 (8mm) needle for the slippers, so I figured I could make two wraps for each stitch on the size 6 (4mm) needle and come up with the same approximate gauge. A size 5 probably would have worked perfectly, but I made do with the size 6, as the slight gauge differences will vanish in the felting process. 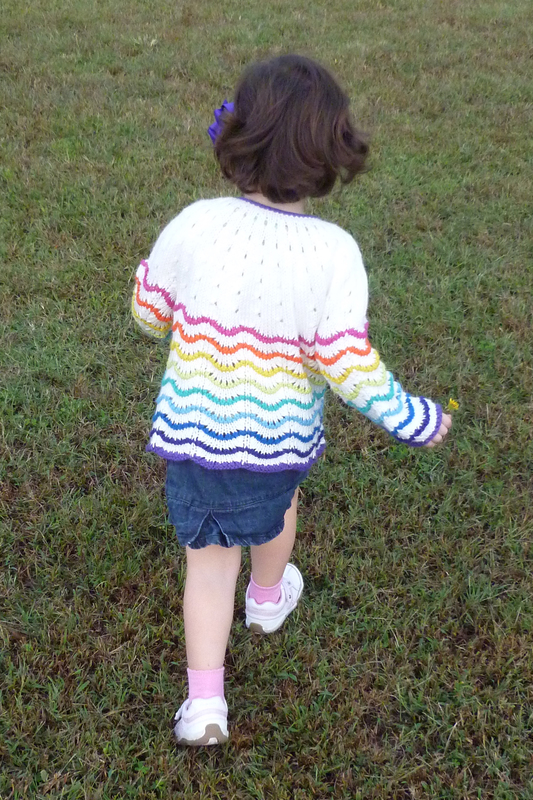 Once I’d finished the slippers, I reached for my next project, the scalloped lace cardigan. 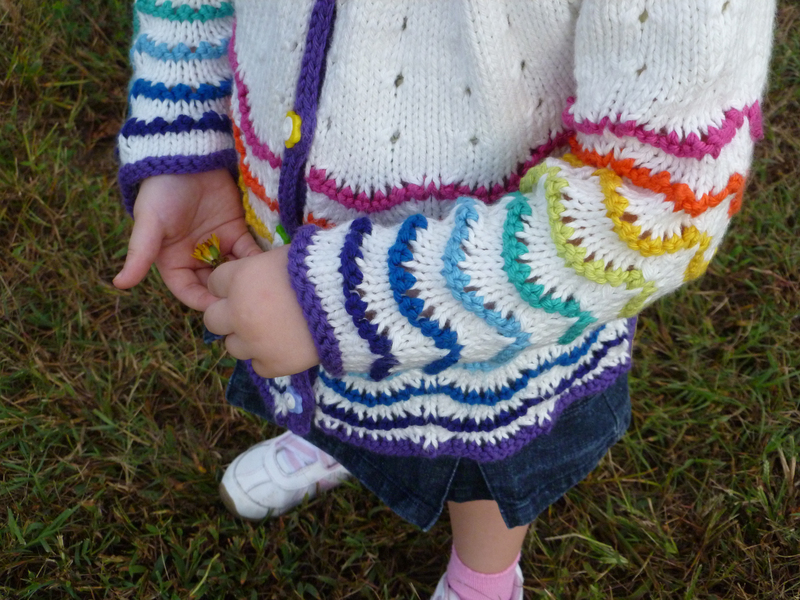 I carefully removed the waste yarn from the sleeve stitches and put them back on the needles. Then I picked up stitches from the underarms and resumed working in the round. I worked up to the point where I needed to work the first color, and then I reached in my bag. You guessed it; I had every color but the one I needed to use first. Another d’oh! Think of me as your public service announcement: If you’re planning to travel, pack your knitting projects first! 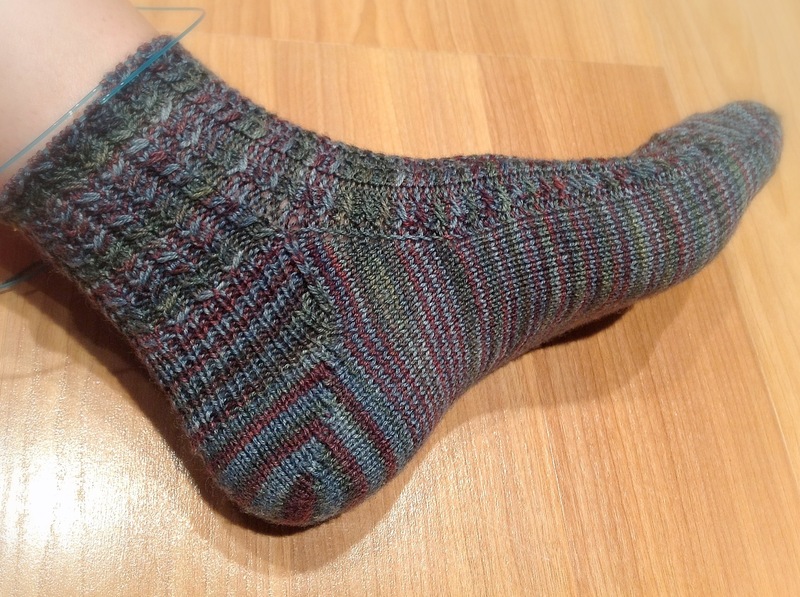 I finished my first sock. I’m pretty happy with it, but I’m going to make a few tweaks with the second sock (make the toe and heel a tad narrower, make the gusset a bit smaller, and make the cuff at the top a tiny bit tighter). 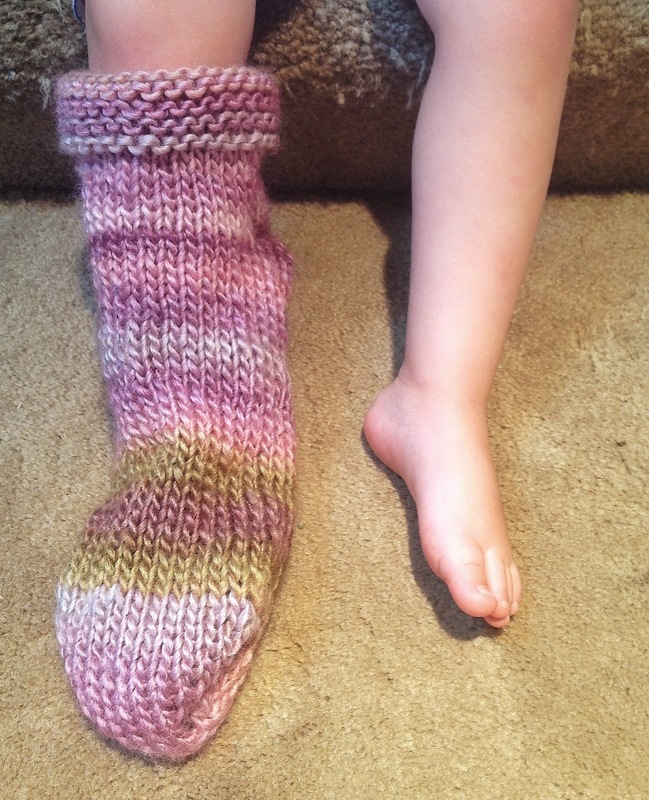 I was all set to cast on for the second sock when a little munchkin stole my sock and put it on. (It came up to her thigh.) When I tried to get it back, she pitched a fit and refused to give it back, insisting that she needed a sock, too. So what’s a mom to do? Well, first I tried to distract her by offering up a store-bought sock. She’s no dummy, though, so that approach was doomed from the git-go. 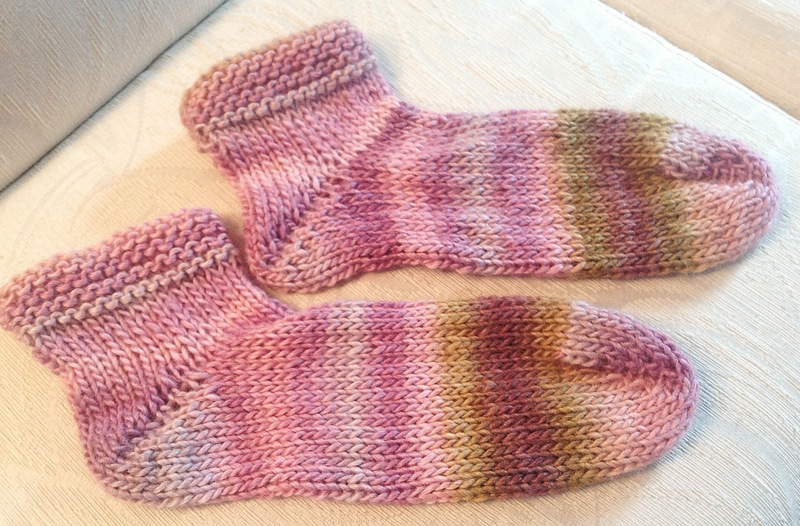 I had no choice by to grab some pretty sock yarn and cast on for a sock. 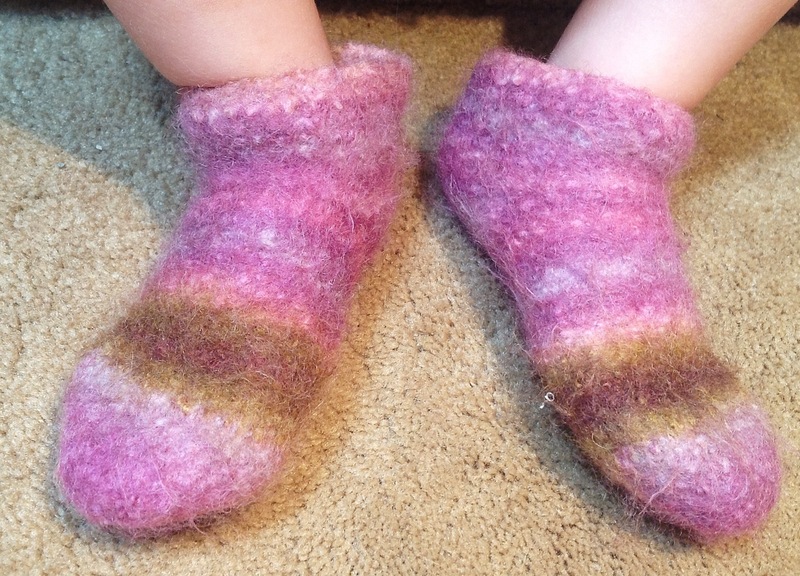 Only that wasn’t going to turn into a sock fast enough for my munchkin, so we went to Plan C: Felted slippers. The munchkin was equally skeptical about the slippers, but she did think the splashing about in the sink part was pretty fun (we have a new front-loading washer, and I wasn’t sure I could felt them enough in there). 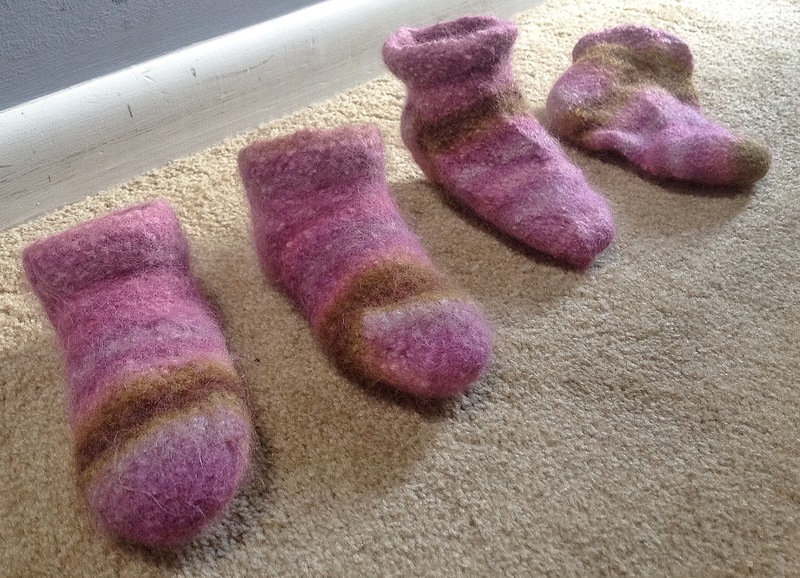 They actually felted up a bit too much, so I have a feeling I will be knitting up another pair soon. That’s okay; they are a seriously quick knit. I knit up the first slipper while watching the Olympics Friday night and knit up the second Saturday night. I actually felted them a little too much. (Who knew? Score one for elbow grease!) I also used a short-row heel without adding a gusset, so it’s a bit of a squeeze to get your heel in. (I’ve been kind of obsessed with them lately, so I slapped one in there without thinking about it too much.) Felt slippers usually stretch a bit, though, so I think they may be okay in the long run. I still need to paint the bottoms with some puff paint to make them a little less slippery.